Sony VPL-VW85 review | What Hi-Fi? Sony's proprietary SXRD technology lies at the heart of this projector. It's a variation of ‘liquid crystal on silicon' or LCOS technology, a reflective (like DLP) rather than transmissive (as in LCD) technology. Three 1080p LCOS chips are used, delivering what ought to produce a higher contrast, higher resolution image than rival systems. This is not for those who like to keep the purse strings firmly shut. It does, at least, look the part, feeling solid and being finished to a high standard. A hefty, nicely wieldable remote control is bundled, too, with backlit keys. Elsewhere, everything that should be here, is here: there are two HDMI inputs, a Full HD resolution and Sony's Bravia 2 Engine. Sony claims a whopping 120,000:1 contrast ratio on top of all that. Watching The Lord of The Rings Blu-ray release, we're impressed with what we see. Fans of Sony TVs won't be surprised to hear that the picture is cleaner than a new car's glove box, albeit minus the curious aroma. There's not so much as a crumb of noise on display, even when delivering the most challenging of wide expansive shots. Motion is handled smoothly, too, though once again we prefer the motion processing off. That, of course, is a personal preference decision for the most part. Happily, the promises of the technology prove to be based in reality, too. Striking contrast levels deliver bright, crisp whites alongside decent black levels, while the sense of depth on the screen makes for an involving, realistic picture. For the last word in subtlety this may be pipped elsewhere, but there's no denying its class. So, it's been a doddle to set-up thanks to motorised lens controls and then proceeded to run fairly quiet in operation. It's clear that we like this projector plenty. So what's our beef? Well, the price tag. 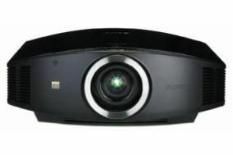 Price will always fluctuate – whatever you do search out the prices on all of these projectors before making a purchase – but at around the £5k mark, this Sony doesn't do enough to justify itself over five-star rivals such as the InFocus ScreenPlay SP8602 and JVC DLA-HD550.